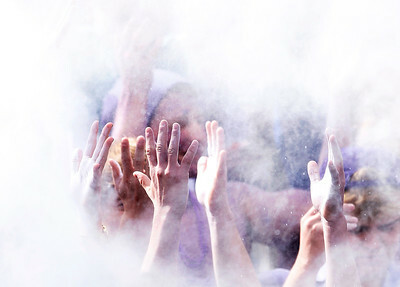 Matthew Apgar - mapgar@shawmedia.com Cary-Grove fans toss white powder into the air at kickoff of their homecoming football game against Jacobs on Saturday, Oct. 10, 2015 at Cary-Grove High School in Cary. 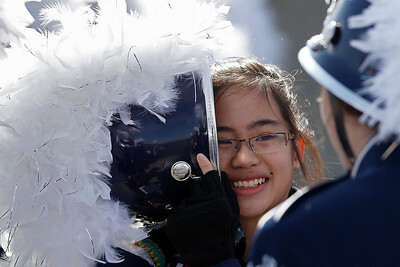 Matthew Apgar - mapgar@shawmedia.com Cary-Grove marching band members Jaime Osakada, left, and Lauren Dreves, both 17 and seniors, entertain themselves before their homecoming football game against Jacobs on Saturday, Oct. 10, 2015 at Cary-Grove High School in Cary. 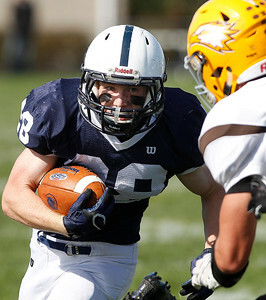 Matthew Apgar - mapgar@shawmedia.com Cary-Grove's Ryan Magel runs the ball down the side as Jacobs' Kyle Copeland gives chase during their football game on Saturday, Oct. 10, 2015 at Cary-Grove High School in Cary. 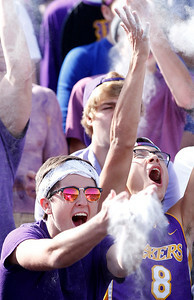 Matthew Apgar - mapgar@shawmedia.com Cary-Grove's Kevin Hughes lets out a celebratory yell after scoring a touchdown against Jacobs during their football game on Saturday, Oct. 10, 2015 at Cary-Grove High School in Cary. Matthew Apgar - mapgar@shawmedia.com Cary-Grove's Tyler Pennington takes the ball for a run with a lot of blocking help against Jacobs during their football game on Saturday, Oct. 10, 2015 at Cary-Grove High School in Cary. 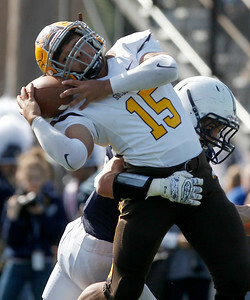 Matthew Apgar - mapgar@shawmedia.com Jacobs quarterback Christopher Katrenick is sacked by Cary-Grove's Kevin Pedersen during their football game on Saturday, Oct. 10, 2015 at Cary-Grove High School in Cary. Matthew Apgar - mapgar@shawmedia.com Cary-Grove's Kyle Pressley, left, runs the ball through Jacob's Blake Tatgenhorst during their football game on Saturday, Oct. 10, 2015 at Cary-Grove High School in Cary. 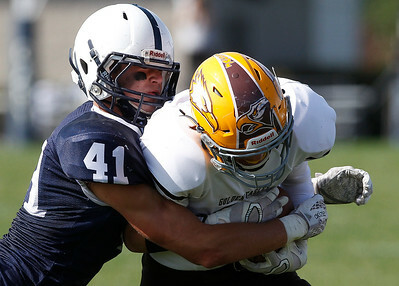 Matthew Apgar - mapgar@shawmedia.com Cary-Grove's Benjamin Getka tackles Jacob's Jared Chase during their football game on Saturday, Oct. 10, 2015 at Cary-Grove High School in Cary. 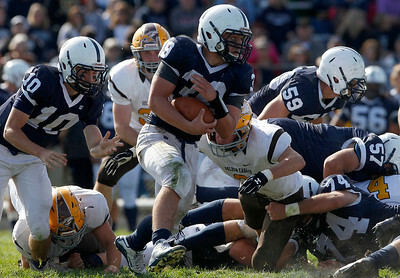 Matthew Apgar - mapgar@shawmedia.com Cary-Grove's Tyler Pennington makes his way into the end zone with the ball despite an attempt to stop him by Jacobs' Kyle Copeland, left, and Trevor Fitzsimmons, right, during their football game on Saturday, Oct. 10, 2015 at Cary-Grove High School in Cary. 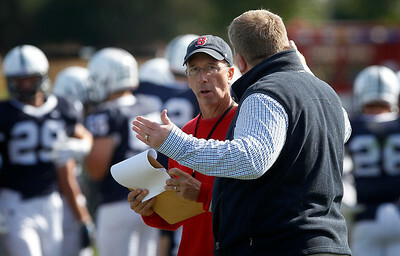 Matthew Apgar - mapgar@shawmedia.com Cary-Grove principal Jay Sargeant corrals professional, credentialed media between the end zone and the twenty yard line during their football game against Jacobs on Saturday, Oct. 10, 2015 at Cary-Grove High School in Cary. Matthew Apgar - mapgar@shawmedia.com Jacobs' Nicholas Washington catches a pass and holds onto it for the touchdown despite a hard hit from Cary-Grove's David Daigle during their football game on Saturday, Oct. 10, 2015 at Cary-Grove High School in Cary. Matthew Apgar - mapgar@shawmedia.com Cary-Grove quarterback JP Sullivan runs the ball through the Jacobs defense during their football game on Saturday, Oct. 10, 2015 at Cary-Grove High School in Cary. Jacobs' Nicholas Washington catches a pass and holds onto it for the touchdown despite a hard hit from Cary-Grove's David Daigle during their football game on Saturday, Oct. 10, 2015 at Cary-Grove High School in Cary.